Our Candy kitchen does contain various ingredients which are known allergens (Tree Nuts, Dairy and Gluten) because these ingredients are in our facility we cannot guarantee any of our candy to 100% Nut – Gluten or Dairy free. Can I only place an order through the website? No, you can give us a call during our normal business hours and we are happy to take your order over the phone. If you don’t see what you are looking for online and saw it in our store or would like to put a special box or gift basket together we are also happy to do that over the phone as well. Where is the best place to keep my chocolates after I take them home? The best place to keep your chocolates is in a room that is between 64 and 68 degrees with low humidity and of course away from direct sunlight and any other heat source. So many people make the mistake of putting them in the refrigerator but this is not a good idea for a few reasons. The first issue is that due to the fact that chocolate is very susceptible to absorbing odors; they will often pick up the flavor of any strong odors that could be in the refrigerator. The second issue is that refrigeration may cause the cocoa butter in the chocolate to migrate to the outside of the piece and cause the chocolate to turn white. Thirdly the refrigerator holds a lot of humidity and will cause condensation on the chocolates which will make them discolor and make the pieces a little tacky to the touch. How long will my chocolates/truffles last after I purchase them? Any solid chocolate pieces will last up to a year or so believe it or not. However, any filled pieces such as caramels, creams, jellies or toffee have approximately a 6 to 8 week shelf life. Truffles have approximately a 2 to 4 week shelf life due to the fact that they are made with fresh heavy cream. 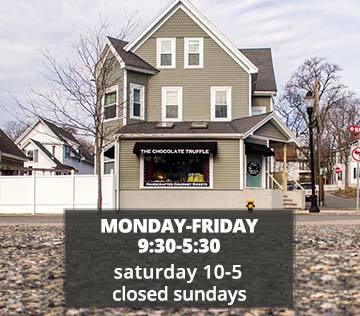 All of this information is based on the fact that the chocolates or truffles are stored in the recommended 64 to 68 degree low humidity environment. 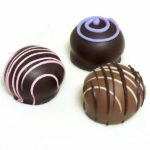 A truffle is a combination of scalded heavy cream, blended with a creamy rich chocolate, and infused with different flavors to create a ganache. The mixture is left overnight to cool and then hand rolled and hand dipped in our premium chocolate. 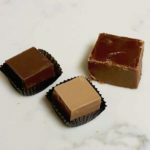 What is the difference between regular fudge and Swiss fudge? Our regular fudge is traditional fudge that perhaps you’ve made at home. It is a combination of light cream, sugar and butter that is cooked and then flavored, poured into pans and left to set overnight. Swiss Fudge on the other hand is really a chocolate it is fudge in name only. It is a blend of a variety of chocolates with a touch of coconut oil which gives it a signature velvety texture, smooth, creamy and delicious! We do not except returns. The only exception is if you receive an item that is damaged.